This plaid shirt has a very soft transition between the blues and the greys. It is a rare non-Western style shirt, that does up with buttons instead of snaps. It has one breast pocket on the left (no flap) and the pocket plaid is laid in the same direction as the rest of the shirt. It first appears in Houses of the Holy (2x13). Sam wears it after the second murder of the episode until the very end. It reappears in It’s the Great Pumpkin, Sam Winchester (4x07), when Sam wears it when he is and Dean are researching in the motel room after Dean discovers that the cheerleader is most likely the witch. He continues to wear it until after he exorcises Samhain. 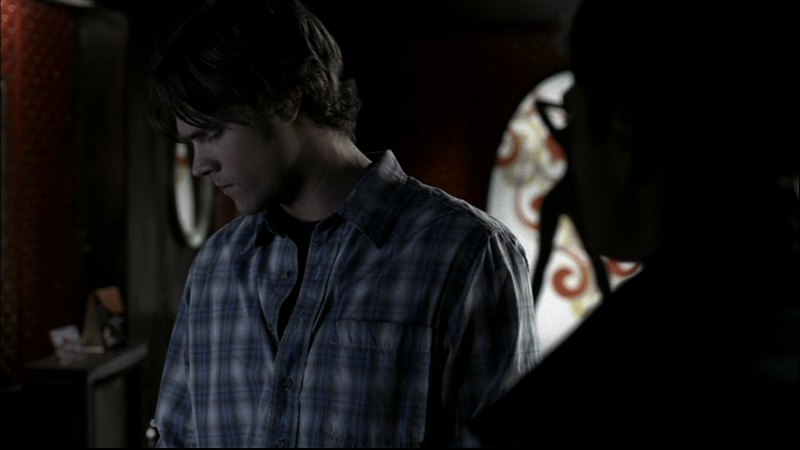 In Book of the Damned (10x18), Sam wears this shirt from the beginning of the episode until after they defeat the Stynes and Sam supposedly burns the book. In The Vessel (11x14), Sam wears this shirt for almost the entire episode, only changing into something else for the very last scene on the pier.